The rollback of auto emission standards: Will you pay less? If you are hoping for lower car prices thanks to the EPA's rollback of costly Obama-era rules on auto emissions and fuel economy, think again. California's determination to maintain its own tougher standards — plus the Trump Administration's tariffs on steel and aluminum — make that unlikely. An automakers' trade association, the Alliance of Automobile Manufacturers, praised the EPA proposal on air pollution rules this week, saying they will help to "keep new vehicles affordable to more Americans." 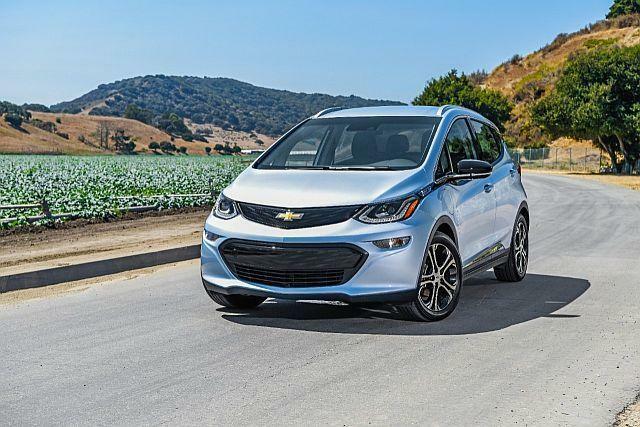 The rules could slow down additional spending for pollution control equipment and the development of additional electric cars like the Chevrolet Bolt (pictured above). But automakers are also protesting President Trump's tariffs on imported steel and aluminum. Toyota said in a statement that the tariffs "would substantially raise costs and therefore prices of cars and trucks sold in America." Various industry estimates of the added cost have ranged from $200 per vehicle to as much as $1,000. Let's take a closer look at these policy crosscurrents. These rules, put in place by the Obama-era EPA, are aimed at limiting auto emissions of carbon dioxide — a major contributor to climate change. They call for automakers to produce cars with average fuel mileage of about 40 MPG by 2025. That is about 10 MPG higher than the current level. California has a special legal status which allows it to set tougher standards than the federal level, and the state has vowed to defend this right in court. California's resistance has extra weight because it involves 13 other states — mostly in the Northeast and Northwest — which adopted the California rules. Together, these states account for nearly 40 percent of U.S. car and truck sales. Thus there could be two sets of rules: One for California and its allied states and another for the rest of the country. But that's unlikely to happen, says industry analyst Rebecca Lindland of Kelley Blue Book. Rather than build cars to two different standards, automakers will likely match the higher, more expensive California standards, she says. Standards in many other countries will remain more stringent. And the mechanical basics of a company's vehicles are often similar here and abroad. "These are global automakers who see the rest of the world marching in a different direction," says Michelle Krebs, analyst for AutoTrader. "To play in other markets, they must meet the standards of other countries." A court battle with California and its allied states could take several years to be settled -- and could even reach the Supreme Court. In the meantime, automakers must move ahead with their product planning and design. Even if a legal fight is avoided, the California standards — now the same as the federal rules — would remain in force. The New York Times is reporting that representatives from the EPA and the California Air Resources Board have been negotiating toward a compromise to avoid the legal struggle. One proposal would keep current standards in place but give automakers more flexibility in meeting them. President Trump's proposal to impose 25 percent tariffs on steel and 10 percent on aluminum has increased uncertainty for the auto industry. As expected, China announced retaliatory tariffs on many U.S. goods, including autos. But the impact on consumer costs remains uncertain. Proposed exemptions for Canada and Mexico — two of the largest producers of steel imported into the U.S. — could mitigate the impact on automotive costs, notes Frank DuBois, a professor at American University's Kogod School of Business and an expert on the global supply chain. Even if the exemptions for the U.S.' NAFTA partners are not implemented, the tariffs could have some unintended consequences. As DuBois noted, "Companies could shift some production to Mexico, buy cheaper Mexican steel and then export the cars to the U.S. since there is no tariff on the finished product.